Be the first to hear about their new releases and deals. Download the Booksprout app and search for Carmen Richter today! I'm an independent author of an ongoing romance series called Sealed With a Kiss who writes as a labor of love. I have a day job in the claims department at an insurance company, so writing is a welcome escape after talking to a lot of people who are having bad days every day. When I'm not writing, I love going to the movies and attending concerts and live theater. 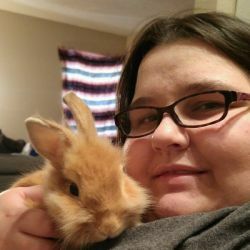 I live in the Kansas City area with my boyfriend, Brett, a bunny named Marty, and a cat named Mal.